Repeat the tasks listed in sessions 3-5 with the vehicle in reverse gear at idle or slow speeds. Backing from one target to another allows your teen to practice seeing, steering, and speed control skills with the vehicle in reverse gear. Switch places with your teen to demonstrate each backing task. Movement of the steering wheel with one hand is recommended only for backing maneuvers that do not require full left or right turns. Backing and steering with one hand requires shifting one’s hips and seating position so the driver’s head can be turned to see beyond the head restraint. 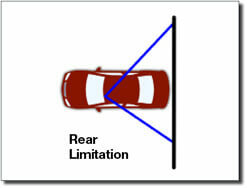 One loses depth perception when using the mirrors to guide the vehicle when backing. To improve balance, the driver’s right arm can be draped over the back of the seat. The left hand grips the steering wheel near the top and turns it in the direction the driver wants the vehicle to go. Sharp turns while backing may require use of both hands. Since it is more difficult to maintain steering control and vehicle balance when the vehicle is in reverse, emphasize backing at slow speeds. Reverse is a more powerful gear than drive, so coach your teen to use the accelerator pedal carefully, if at all. make frequent quick checks to the front and stop at a designated line. make quick checks to the front and sides. To align the rear bumper 3-6 inches from a line or curb, the driver should stop when the line or curb appears near the middle of the rear right window when looking over the right shoulder. Have the teen get out of the car to see whether the rear bumper is 3-6 inches from the designated line. Adjust the vehicle’s position as needed, and reestablish the rear side window reference point from the inside of the car. To align the rear bumper 3 feet from a curb when backing around a corner to the right, the driver looks over the right shoulder and should see the curb in the rear side window near the corner roof. When backing around a corner to the left, the pivot point is the center of the rear axle between your rear tires. To establish a three-foot pivot point, the driver looks over the left shoulder and aligns the corner of the turn with the rear left tire.